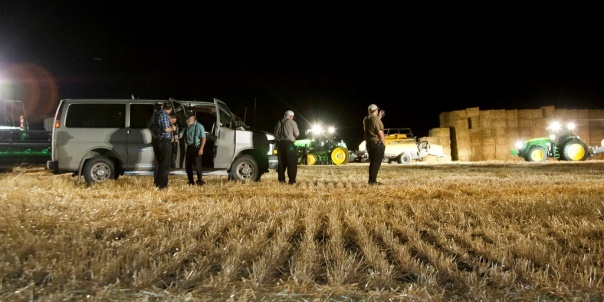 In every Hutterite colony, the minister or Prediger is also the chief executive and he, along with an advisory board, makes the day to day decisions. The minister’s duties include conducting church sermons, marriages, baptisms, funerals, disciplining members of the church and helping to manage the colony. The advisory board consists of the minister, the colony manager (Wiet or Hausholter), the farm manager (Weinzedl) and two or three witness brothers (Zullbrueder) who are elected for life. The advisory board acts as the board of trustees or the directors of the church corporation. They make decisions regarding changes related to the day-to-day operation of the colony, economics, job positions and colony discipline. The actions of the council are in turn directed by the whole congregation, and the councilors themselves are subject to the Church. Men taking a break from the harvest. The colony manager (Hausholter or Wiet) oversees all of the colony’s enterprises. He is also the secretary treasurer who’s responsible for the financial operations of the colony. The farm manager (Weinzedl), also known as the work distributor, supervises all field work. Under his jurisdiction are all workers over fifteen years, who have not been appointed to specific jobs by the colony. This group of three (four if there is an assistant minister) meet every morning for about an hour. Other members of the colony will drop in during this time to discuss new ideas, make travel arrangements and to bring issues to the leaders’ attention. The witness brothers (deacons or Zullbrieder), besides acting as advisory board members are generally employed, like all other members, managing one of the colonies numerous activities. Generally, the German school teacher is one of the deacons. They are not typically involved in the morning meetings, but if larger decisions need to be made, they will often be consulted before bringing the matter to the whole community. This group as a whole is called the Zullbrieder: the ministers, colony manager, farm boss, and two witness brothers.